They battle demons and monsters, hunt ghosts and defend us against the things that go bump in the night. They are Occult Detectives and they’ve been a staple of pulp fiction since the beginning of those glorious, garish magazines. 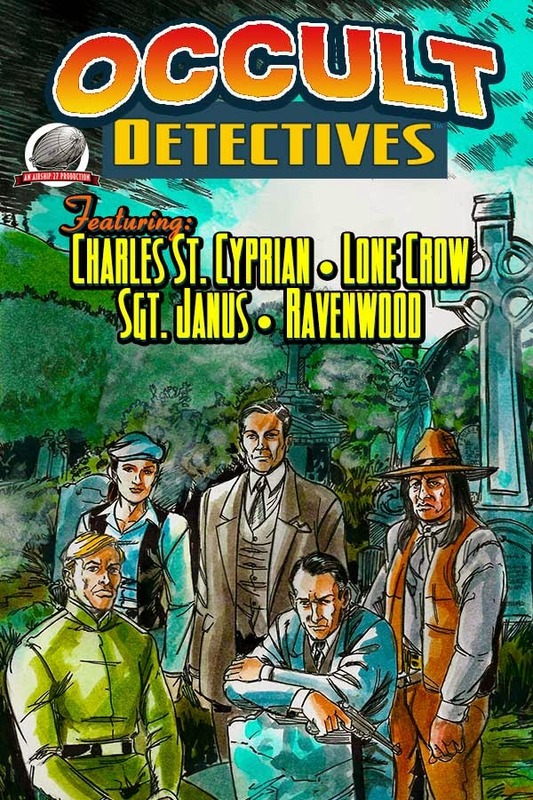 Now Airship 27 Productions is thrilled to bring you a quartet of tales starring some of the most unique Occult Detectives ever created; three newly minted heroes and one classic master of mysticism. From the days of the Wild West, Joel Jenkins offers up his Indian Shaman hero, Lone Crow. Then we have Josh Reynold’s colorful Charles St. Cyprian, the Queen’s own Royal Occultist, followed by Jim Beard’s Sgt. Janus, the Spirit Breaker. And we culminate with a little known pulp classic figure, Ravenwood; the Stepson of Mystery as chronicled by Ron Fortier. The book features interior illustrations by Davis and a cover, colored by Jesus Rodriguez, that spotlights all of the heroes together in a setting outside of space and time. Get ready to take on possessed gunfighters, eerie mesmerizing spirits, a bewitching temptress and a legion of the undead as these four brand new tales usher you into thrilling adventures beyond the realm of the ordinary; your guides….the Occult Detectives. The book is now Available at Amazon.com and will soon be out on Kindle.